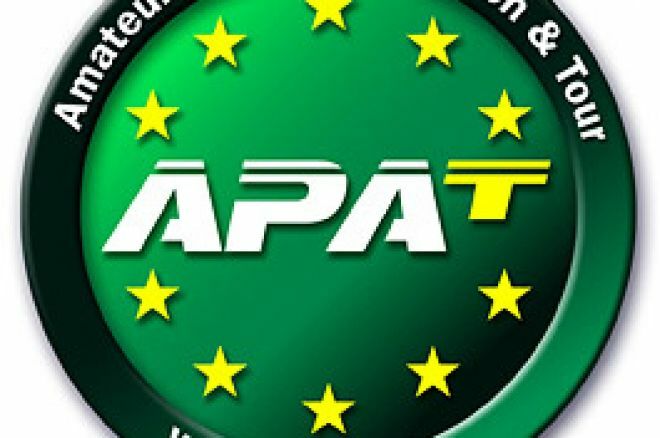 The Amateur Poker Association &amp; Tour (APAT) held its fourth event in its first season live series, the Scottish Amateur Poker Championship in Edinburgh, on 14th-15th April. The event was had130 entries, who qualified by a mix of live and online satellites and member draw. The players were again offered a £75 freeze-out with 10,000 starting chips, a slow clock and significant added value from tour sponsors PokerStars.com via the form of entry into an EPT Season Four event to the winner in addition to their cash prize, trophy, medal and Player of the Year ranking points. Play began at 2.30pm on the first day and despite the deep-stack two players departed in the first level. APAT UK Championship finalist Vicky Glynn's pocket aces fell to Ken Jones who flopped trip threes and Thomas Stanfield flopped a straight and lost to a rivered full house for his opponent with trips. Player of the Year rankings leader Mark Donnelly was also an early departure, holding an over-pair on a seven high board against trips. Early leaders included William McAllister from Glasgow who flopped three sets and rivered two flushes in the first level getting paid several times and Philip Toomer whose straight outdrew Terence Tochel's AA. Also amongst the early contenders were several players who were to feature strongly later in the tournament such as local casino player Phil Starrs together with Charlie Curtis and Duncan Hodgkins. Also running well were Scottish competitors Scott Moore and Stephen Donnelly. The field began to thin quickly as blinds rose through the 600-1200 and 800-1600 levels. Benefiting by building impressive stacks were Toomer (75,000) and Starrs (60,000). Towards the end of the first day the dispersion of the 1.3m chips in play had become very disproportionate. Londoner Alex Gabriel and Toomer had 200,000 between them with 50 runners left. Also on the same table were Craig Kelly and Dubliner Lloyd O'Farrell, a poker blogger, both with good chips. The effect was to leave every other table markedly short-stacked and players in push or fold territory. Early on Day Two Charlie Curtis, who finished second in the APAT Online series Scottish Open, cut a swathe through the early departures knocking three players out by winning pair versus over-cards races. A key hand that was to shape the final stages of the tournament occurred with thirteen players left as the money positions started. Alex Gabriel raised in early position with AQ and was minimum re-raised by James Eccles from Alloa with AA. Gabriel, playing the style that had allowed him to accumulate his chips so fast on the first day, pushed and was of course called. When Eccles' AA stood up he had one a 220,000 pot, crippled Gabriel's stack and playing in only his second live tournament shot to the chip lead. On the final table bubble Welsh Championship finalist Richard Davies secured his final table position when knocking out Craig Kelly, AQ versus 10 10, all-in pre-flop with a Queen on the river. The final table saw three former Championship finalists in Davies, Talbot and Hodgkins and four Scottish players positioned to win the title. In the first part of the final table the key participant was Phill Starrs. On the first hand of the final he knocked out Charlie Curtis with both players moving in on a 10 9 2 flop, button versus big blind. Starrs' top pair queen kicker held on to defeat Curtis' A9. Then Starrs made a move on the button with Jx and pushed on a Jxx flop only to see Starrs turn over AA in the big blind on a cleverly played hand. After eliminating these two players Starrs had nearly half the chips in play. Alan Brady and Stephen Patterson the two short-stacks then battled over several hands with Patterson finally prevailing to knock Brady out 7th. There followed another key hand. Steve Talbot had been extremely aggressive in the prior action, moving in continually into unopened pots to secure the now high blinds. In the Small blind with Q8 he limped and Starrs in the big blind checked behind. Both checked a 7 10 Q flop. On the 5 turn, Talbot bet, Starrs raised and Talbot pushed in. Priced in to call, unhappily, Starrs did so and turned over 5 3 for bottom pair. When a 3 hit the river Talbot was outdrawn, to exit in 6th and leave Starrs in an even more commanding position. Patterson's long short-stacked grind ended soon thereafter to leave the final four players on the next bubble before the leap to bigger prize money, championship medals and a shot at an EPT seat. In an inevitable confrontation Philip Toomer's QQ then raced James Eccles' AK in a 450,000 chip pot. A King on the flop propelled Eccles into serious contention and knocked Toomer out in 4th. Eccles then went on a serious tear, flopping the nut straight three handed blind on blind with Davies who flopped two pair. When the turn and river did not bring the needed full house Richard Davies was out in third. Nevertheless the ranking points secured had taken Davies into second place in the Player of the Year rankings (the winner receiving a trip to the PokerStars.com WPT Caribbean Adventure tournament) a few points behind Mark Donnelly. Heads- up Eccles began with a small lead but was playing a wily and far more experienced player. Starrs was taking advantage of this showing constant aggression to push Eccles off pots and put himself into a modest chip lead. Occassionally though this aggression turned into over-playing, which Eccles took advantage of, doubling up to restore his lead. The crucial hand played out quickly. Starrs raised on the small blind with K9 and Eccles pushed with a pair of tens. Starrs instantly called and saw a miracle flop of K K 9 to leave Eccles visibly shaken and down to 85,000 of the 1.3m chip in play. Twenty minutes later, Eccles having doubled up twice in the meantime, the final hand saw Starrs take top pair and a straight draw against Eccles' up and down straight draw all-in on the flop. Eccles missed and Phil Starrs won the 2007 Scottish Amateur Poker Championship.